A lot of the Red Dead Redemption 2 Survivalist Challenges are simple tests like catching specific fish, or trying to hunt things with a lowly varmint rifle, but not all of them are easy. There's crafting to be done, multi kills to rack up and a few trickier challenges where you have to catch fish while standing on train tracks, or kill an animal while it's feeding on a corpse. There's some good rewards however if you can 100% it all, and it gives you something to do in Red Dead Redemption 2 as a respite from the all the usual horse riding, gambling and so on. You’ll most likely complete this challenge organically through a story mission, but if not, Bluegill fish can be found almost anywhere in Red Dead Redemption 2’s body of rivers and lakes. Use cheese as bait for a better chance at catching these little guys, and you’ll find three of them in no time. To complete this challenge, you’ll need to hunt five animals down, haul their carcasses back to camp or a nearby trapper, and hand them in to fill up the meter. Done that? Good, onto the next challenge. You can purchase a varmint rifle from the gunsmith in Valentine, which is a small game weapon built specifically to score clean kills against critters and rodents like rabbits, rats, or racoon. Buy one, find some nearby varmints, and fire away. You can pick up the recipes for each of these arrow types from the fence at Emerald Ranch, and crafting them is then just a matter of harvesting the right ingredients and setting up your campfire to access the crafting menu. You’ll need to make at least one of each to complete the challenge. The bayou is in Lemoyne, on the South East side of the map, riddled with all sorts of interesting wildlife, including alligators. That makes it slightly more difficult to fish in peace, but it shouldn't be too hard to find a riverboat by any shack on the shores, while the train tracks are easily spotted. Cast your rod from both, catch a fish, and the challenge will be completed. The good news with this challenge is that any corpse, human or animal, counts. That means you can take out a few bandits (or innocents) on the road, wait for some carrion of nearby predators to sniff out the free meal, and sneak up on them for a one-shot kill to the head. Do this five times, and the next challenge awaits. Small game animals include any critters like rabbits, skunks, racoons, possums, rats... basically any small mammal with fur. You can craft small game arrows using flight feathers from your camp fire crafting menu, and to get five consecutive hits, you'll need to find a group of animals near enough to each other for a quick succession of shots without missing. Don't worry, there's no time limit between the shots, as long as you don't use your small game arrows for anything other than critter kills. To craft these tomahawk types, you'll need to first find or buy their recipes from a fence, one of whom can be found at Emerald Ranch to the east of Valentine. With the recipes learned, gather the right ingredients, and craft them from the correct tab after setting up a camp fire in the wilderness. To improve your chances of catching bigger and better fish, head to Legendary fishing locations discovered on your map, and purchase lures from general stores to target specific types of fish that tend to weigh heavier than others. It's partly down to luck, as is the case with real fishing, but 19lb isn't a massive ask, so you should be able to complete this challenge within an hour or so. This one's going to be tricky, as that includes all of the Legendary fish throughout the world of Red Dead Redemption 2. You'll need to complete the campaign before you can even attempt this challenge, but you can track the types of fish you've caught (and the ones you have left) in the 100% section of the progression menu. 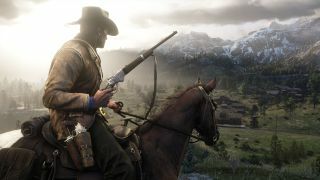 For more Red Dead Redemption 2 tips, check out all the things we wish we knew before playing.